NOTE: All the effects were done in the (free) Google photos. 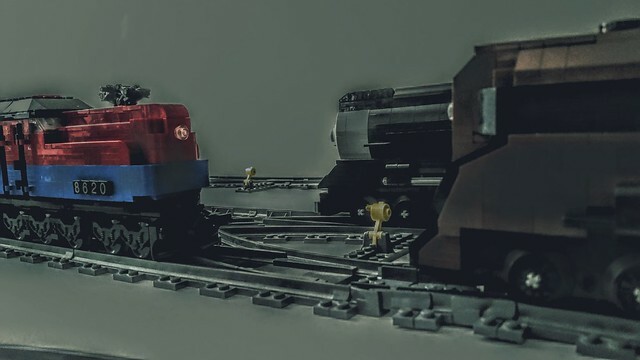 A new locomotive joins the group of built LEGO projects. 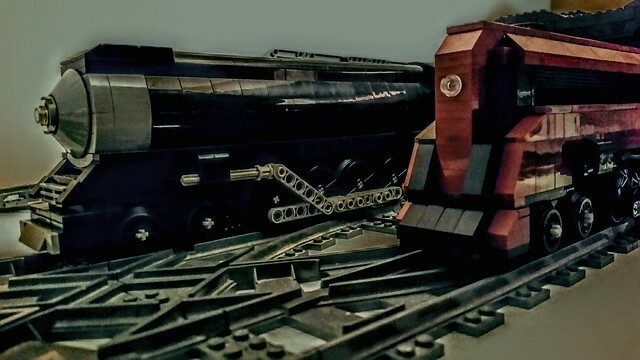 To commemorate this event, I turned a simple photo into what I think looks like a painting with both 4460 (a 4-8-4 GS-6 Daylight) and the new loco, 6847 (a streamlined 4-8-2 Mountain type). Night time at the railroad yard sometime in the late 1960's, and it is almost as quiet as a graveyard. The railroad industry is on life support and yet sill bleeding money at this point in time, with lines of badly maintained and to-be-scrapped engines growing longer every month. 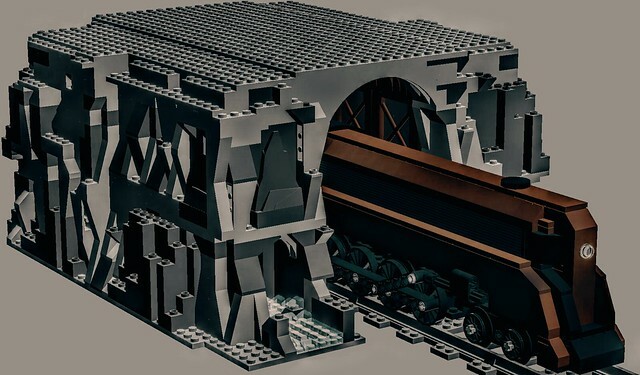 Even Brick Railway systems is feeling the pain, and has sidelined streamlined steam locomotive 6847 in order to have it be "eventually" replaced by diesels. (this decision would late be reversed) Elsewhere, Penn Station in New York City is being destroyed and Amtrak is being set in motion while the giant railroad Penn Central is in it's death throes. "and the words of the prophets are written on the station halls, loco walls." The Emerald Express (headed by 2-6-0 'Mogul" 4613) rounds a tight curve as it heads out of the city of Saint Louis and onto the south-bound mainline track between the Gateway to the West and New Orleans sometime in 1923. The train has stopped here for just a few minutes (long enough for a picture!) as a switch was misaligned and needed to be hand thrown. "Their's a place up ahead and and I'm going, just as fast as my feet can fly!" The 1870's vintage steamer had just been to the company machine shop and had it's balloon stack removed and the engine converted to burn coal when this picture was taken. These modifications were later backdated in the 1920's to allow to the engine to star in Wild Western movies until being retired and donated in 1967. In 2016, the balloon stack was removed again and the engine returned to steam once more with coal as it's fuel. Here we see engine streamlined 4-8-2 "Mountain"-type 6847 roaring through the eastern end of the Raindance Ridge Tunnel sometime in the early 1960's. This tunnel was a bottleneck for traffic for many years, but land ownership issues concerning the Native American tribe who originally owned the land on which it sits caused many issues. The land was apparently never sold to the railroads but was stolen and the law requires all railroad land not proved to be owned by said railroad goes back to the previous owner: the Native American tribe. So, after a decade of legal wrangling, the tunnel was sold to the railroad for a quite large sum of money in 1975. This allowed the second tunnel to be built for eastern traffic about a half mile downstream of the original 1880 alignment, with the original tunnel is used only for West bound trains. The date is sometime in Summer of 1965, the place is Clarksville Grand Central Terminal railroad station, just after the last train has left. The usually busy station tracks are now deserted except for a lone tank engine used for getting coaches ready for their next journey and pulling passenger trains through the washer and onto the servicing tracks. At this midnight hour, the station is quiet and even the steam engine seems to have gone nearly silent, with just a wisp of smoke coming from it's stack. 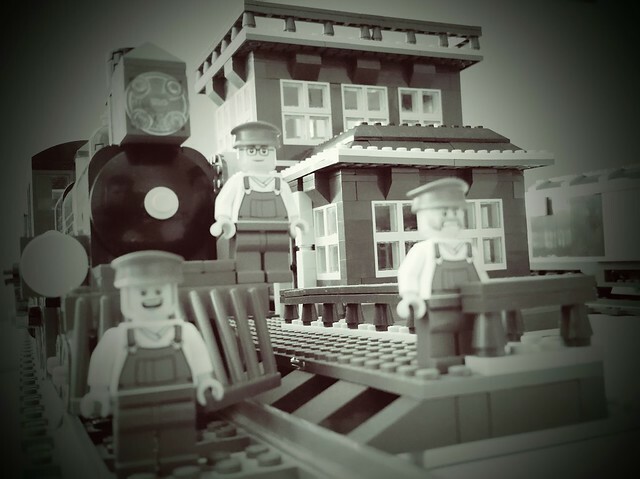 Soon, however, the first sun rays and early Monday morning commuter trains will be arriving and the station will hustle and bustle with the little steam loco running to and fro once more. "I've just closed my eyes again, and climbed aboard the Dream Weaver train..."
I was actually deciding what to call this photo when this Gary Wright song came on the radio. Coincidentally, it features a train in it's lyrics and so the choice to use it was easy. I edited the picture using the free Google photos service, and made it look like it was taken place at night. 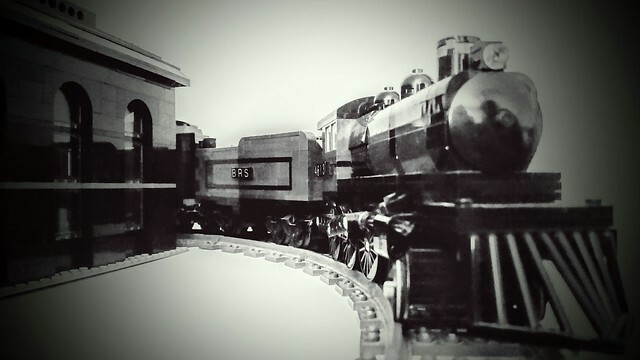 The engines featured are the General Motors Aerotrain, Southern Pacific 4-8-4 "Warbaby" Daylight, and my fictional Brick Railways Systems streamlined 4-8-2. Here we see my 1920's Steam locomotive (a 2-8-2 Mikado) meeting it's replacement in freight hauling, a 1950's Diesel engine (MRS-1, to be precise). The Mikado is pulling it's last train before retirement and eventual scrapping while the MRS-1 has just been delivered factory-fresh from ALCO. 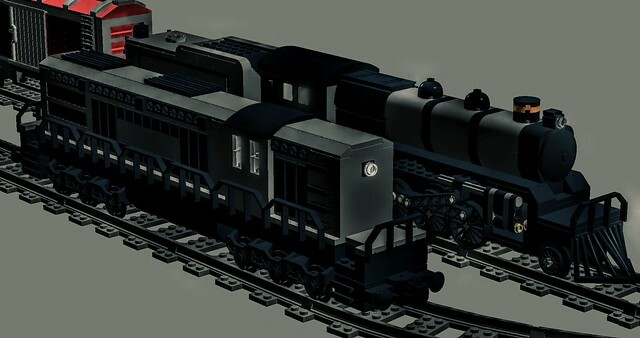 In reality, no one is getting replaced / scrapped,, as both engines will be still used in their respective railroad eras, which do not overlap much. (I should be building the diesel later this year!) Also, the MRS-1 was a military model, and was not sold to civilian railroads until it became surplus to the US Army's needs in the mid 1970's. Great photo, too. It'll be my wallpaper for a while. "Old Charlie stole the handle, and the train it won't stop going - no it won't slow down!" Anyway, I love that song too, and thanks for stopping by! You could use google photos like I do, it is free and really makes a picture look nice. They each have captions and names. Please see first post for details. See the first post for more details!